Originally published under the title, "Turkey and NATO: From Loveless to Hateful Marriage." The West's self-imposed Pollyanna game over Turkey a decade or so ago seemed delusional to most Turks who knew the true nature of the Islamist politician lauded as a pro-reform, pro-West democrat. Recep Tayyip Erdoğan, western leaders argued, would consolidate Turkey's democratic system, bring the country closer to its western allies and even win a historic membership in the European Union. Erdogan's Turkey would be a perfect bridge between western and Islamic civilizations, thus being a role model for less democratic Muslim nations. The founding values of NATO, such as the safeguarding of freedom and the principles of liberal democracy, individual liberties and rule of law, are rare commodities in today's Turkey. A decade later, obliviousness has turned into bitter feelings, but Pollyanna is still out there, all smiles. In the words of Fabrizio F. Luciolli, president of the Atlantic Treaty Organization: "Since sixty-five years [sic], a mutual commitment binds Turkey and NATO, which can hardly be scratched by contingent interests or frictions, or replaced by new strategic directions. In its dialogue with Turkey, NATO once again reveals its unique role as transatlantic forum for political consultation on security issues." Turkey-optimism is not a new phenomenon in the West. But it is fascinating that it still finds buyers in the marketplace of ideas. 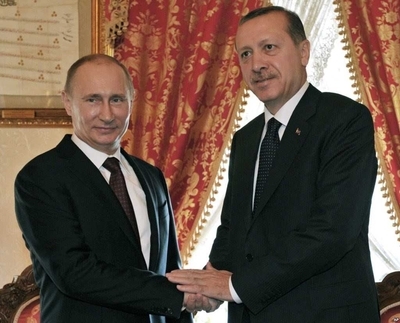 In April 2009, Turkey and Syria held a joint military exercise – the first of its kind between a NATO member and a Russian-armed and trained client state. In September 2010, Turkish and Chinese aircraft conducted joint exercises in Turkish airspace. This, too, was a first for a NATO air force. In 2011, before finally providing NATO forces with logistical support for their anti-Qaddafi campaign, then-Prime Minister Erdoğan angrily asked, "What business can NATO have in Libya?" Beginning in 2015, Turkey came under international suspicion for systematically and clandestinely abetting various jihadist groups in Syria, including, allegedly, ISIS. Speculated to have included logistics and arms, this support reflected Ankara's distinct approach to the Syrian theater: while the West's primary goal has been to fight ISIS, Erdoğan has sought to topple Syria's Alawite President Bashar Assad and install a Sunni, pro-Turkey, and Islamist regime in his place. where policymakers are now wondering, among other concerns, how a NATO ally will simultaneously operate a Russian-made air defense system and the planned, US-led, multinational F-35 strike fighters. Turkey, a partner in the Joint Strike Fighter group that builds the F-35, has ordered a batch of 116 future stealth fighter jets. But its growing relations with Moscow and its recent military campaign in Syria have added to calls for an F-35 boycott. It is not a secret that Washington is quietly weighing that option as Erdoğan threatens to extend his military campaign in Syria to areas (Manbij and the east of the Euphrates) where US troops are aligned with Kurdish militias. Ankara has deemed these militias terrorist organizations and thus legitimate targets. This is not the typical war scenario NATO's first and second largest armies would normally envision. Then there is the problem of like-mindedness. The founding values of NATO, such as the safeguarding of freedom and the principles of liberal democracy, individual liberties and rule of law, are rare commodities in today's Turkey. In January 2018, the annual Freedom in the World report, produced by the US NGO Freedom House, classified Turkey as "not free" for the first time since the report series began in 1999. The country had lost its status as "partly free" due to a slide in political and civil rights, Freedom House noted. Also in January, the World Justice Report, an independent organization seeking to advance the rule of law around the world, said that Turkey fell to the 101st position out of 113 countries in its 2017-18 Rule of Law Index. The future may be gloomier. At a time of rising xenophobia and anti-western sentiments across Turkey, Erdoğan's campaign for the November 2019 presidential elections will undoubtedly target the "evil powers of the West," adding to the isolationist (that is: anti-NATO) Turkish psyche. Erdoğan's militancy will likely strike a chord among his constituents. According to a December 2017 survey by the Turkish pollster Optimar, 71.9 percent of Turks are "against the US" while 22.7 percent are "partly against the US." This in sharp contrast to the 62.1 percent approval rating among Turks for closer relations with Russia. A survey of 393 Turkish businessmen has likewise found 66 percent of them to have an unfavorable opinion of the US; while a survey by Kadir Has University in Istanbul (in December 2017) found that 64.3 percent of respondents viewed the US as the top security threat to Turkey. Burak Bekdil is an Ankara-based columnist and a fellow at the Middle East Forum.